Mercury Adhesives | Made in the USA! Less fillers means more glue in every drop to bond faster, stronger & longer. All our adhesives are medical grade quality and scientifically engineered to minimize fumes & odors. Using only the highest quality ingredients and manufacturing processes, all our adhesives are made and bottled in the USA. Read Our Blog for the FAQ, News, Mercury Moments, Hints and Tips, etc. 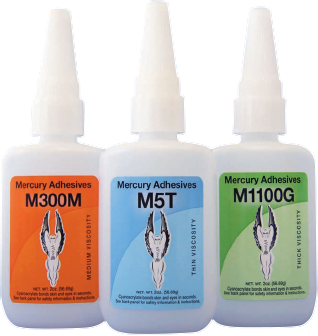 Looking to buy Mercury Adhesives? We stand behind all our products no matter when they were purchased. The Mercury warranty is simple…. Unconditional. Use all of the glue! Do you throw away bottles of CA because the tip is clogged, or the glue is hard inside the bottle? Stop wasting money and use all the glue you paid for! How many times has glue been purchased only to have the tip clog? A needle is used in an attempt to clear it, and if that doesn’t work, the tip is cut down? Or worse, the glue goes hard inside the bottle forcing its disposal and more to be purchased? Mercury has worked hard to solve this problem. First, our bottles are made of a plastic that is impervious to CA. Second, our cap is triple sealed to prevent air and moisture from hardening the glue inside the bottle prematurely. Third, the cap itself has a pin in the top to keep the bottle’s tip from clogging. Lastly, Mercury has an unconditional/unlimited guarantee on all newly purchased CA. If it hardens, we’ll replace it. Mercury has a full range of scientifically engineered high quality adhesives designed specifically for the R/C industry and modelers needs. View this informative video to learn more and see some awesome flight demos. All our products stand up to the competition. Become an official preferred Mercury Adhesive dealer. Access our dealer site for the latest product announcements, easy online ordering and access to our partner program to help grow your business and build customer loyalty.